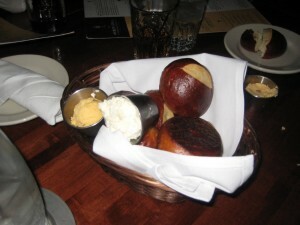 Weber Grill – Grilling Is Their Business and Business Is Delicious! The road trip route took us from Indianapolis to Columbus where we attended the Scion Rock Fest and then continued on to Austin, TX for the South By South West Music festival. The road trip ends there but is still going on, even though I jumped off. 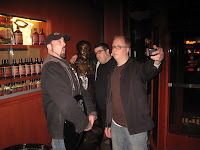 Follow the adventure on the Metal Road Trip Twitter. 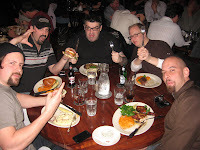 Mark, Rich, Nick, Marc and I started off with the best move we could, “The Weber Sampler” (serves two) with a sampling of Rib Fingers, Beer Can Chicken Tenders, Steak Skewers and BBQ Shrimp. Make no mistake, these were all extremely delicious and I highly recommend ordering it. 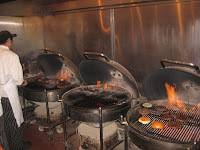 You came to the Weber Grill and you might as well get a great idea of what they are capable of doing. 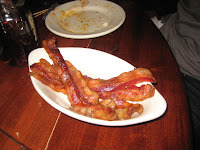 We also ordered an appetizer of the Applewood smoked bacon and that is when the line of the night came out. Our server took a brief pause and replied to our request, “here at the Weber Grill, bacon is ALWAYS free!” You could’ve cut the collective excitement at our table with a pickle spear!! 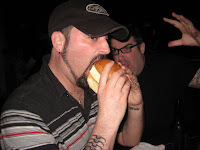 The burger at the restaurant has received high praise from his beef-all-mightiest, Nick Solares from A Hamburger Today and had my mouth watering before it even arrived a the table. While I ordered the “Wisconsin Burger,” which is served with Applewood Smoked Bacon and Cheddar Cheese, there are other options, including a veggie alternative. 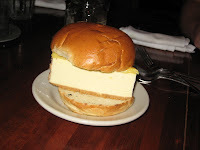 It’s all stacked inside an egg based bun which was similar to a brioche. The patty is made from 100% U.S.D.A. Black Angus beef which creates the quality base to built around a tasty sandwich. It was cooked to a picture perfect medium rare, which isn’t quite the easiest thing to do on a charcoal grill. The bacon…OH MAN THE BACON!! 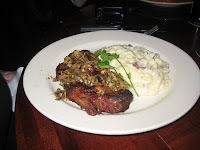 With hints of cinnamon and apple flavors, it was just pure pork beauty. 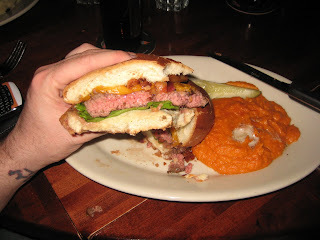 The cheddar added to the over all savory appeal of the burger. 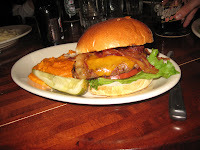 All it took was one bite to confirm, this burger was incredible but of course, I devoured the whole thing!!! While I was basking in the afterglow of a beef touchdown, a server appeared at our table, looked at me and asked “we heard it was your birthday!” It indeed was NOT my birthday but having pulled this prank on others, I went with it. 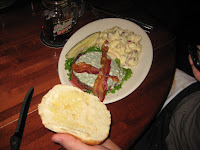 “Yes it is and I just celebrated with your amazing burger!” She then placed down in front of me, a slice of cheesecake, perfectly positioned between the same bun that the burger was served on. It was all Marc’s GREAT IDEA and a pretty funny one at that. I picked it up, just like I would a burger and chomped down. It was some DAMN GOOD cheesecake (please note; the Weber Grill does not cook cheesecake on the grill) and much like the entire experience, highly suggested. 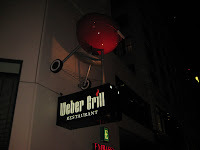 This entry was posted in Uncategorized and tagged the great burger conquest hamburger cheese french fries review weber grill indianapolis in metal roadtrip. Bookmark the permalink. 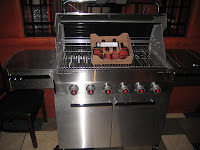 5 Responses to Weber Grill – Grilling Is Their Business and Business Is Delicious! If you watch the video, I am the member of the party who had the plate that appeared to have been licked clean. While I didn't actually put tongue to plate, I managed to get darn near the same effect by just using my knife and fork. I did not have the burger because I knew I would be enjoying one the next day (at a restaurant soon to be featured in a Burger Conquest blog), but fortunately had my initial burger envy quickly subsided by the absolute perfectly cooked, melt on the tip of your tongue filet mignon that I ordered. I am a medium rare man all the way. The slightest overcooking really ruins the piece of meat for me and Weber Grill absolutely nailed medium rare. 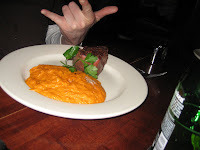 Coupled with a delicious side of sweet mashed potatoes (that admittedly looked like a pile of baby food, but not every side dish can be visually stunning), I was in steak lover's heaven. 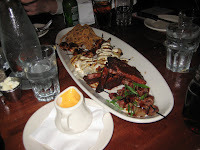 I should also mention that the appetizers were quite good with the exception of the shrimp that was grilled with a marinade that I found to be a little too sweet, but I tend to like my seafood to lean towards the salty side as opposed to the sweet. If and when I find myself in Indianapolis again, then Weber Grill will be a no-brainer meal stop.